Saturday, March 30, 2019 8:39a.m. 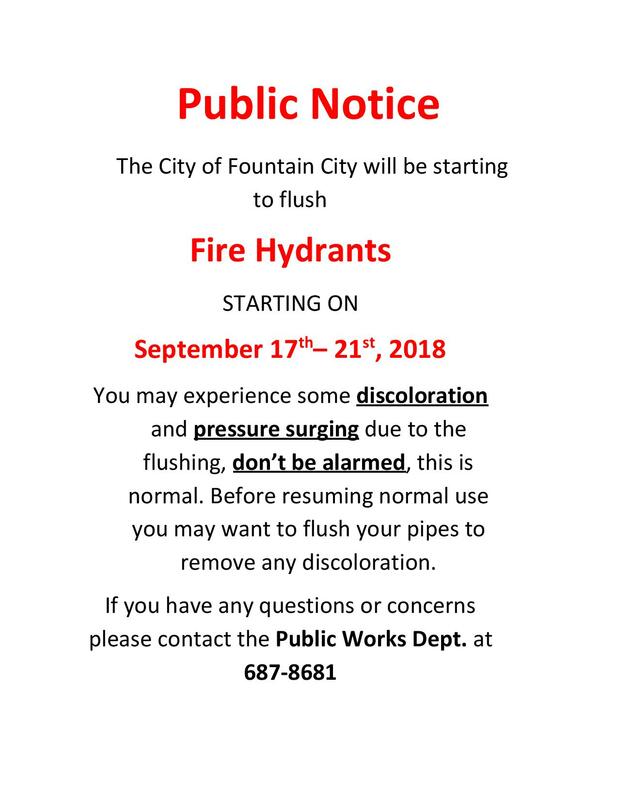 URGENT : Fountain City Residents are asked to restrict their water usage by Public Works Department. The Waste Water Treatment Plant is running at maximum capacity with the high flood waters. The public works dept. is requesting that Fountain City residents restrict their water usage as much as they can. If you have sump pump pumping water from your basement please be sure it is discharging to your yard. The flood waters are expected to crest by April 2nd so we are asking residents to keep their water restrictions in place until that time. 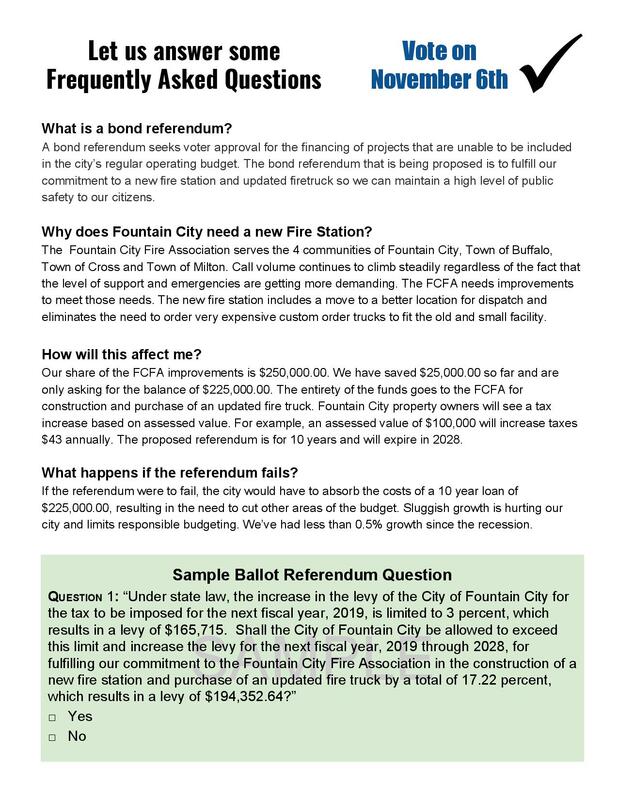 Please contact any city council member with your questions or concerns. Thank you to all that were able to attend the March 20th council meeting. Your input is invaluable as we try to address the upcoming flood predictions. Volunteer Sandbagging will take place this weekend, March 23rd and March 24th from 9 a.m. to 3 p.m. each day. Sandbag operations will be staged on Liberty Street closest to the Post Office and Wing Dam Saloon and you can report there. Please keep in mind that volunteers are needed for many different areas as well as filling sandbags. 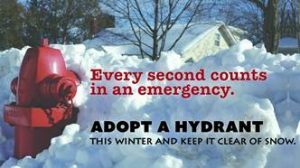 Volunteers please bring a pair of gloves to work in and if you have an additional shovel that’s great too. Please make sure you mark your equipment to ensure it makes it back to you. If you would like to help feed and hydrate volunteers please contact Clare Waters at 608-687-8419. Water, gatorade, snacks, bars, sandwiches, etc will all be needed. Pallets are needed to hold and move sandbags. If you can donate, please contact Gwen Katula 507-459-5547 call or text to arrange where to deliver or be picked up. Residents impacted by flooding are responsible for protecting their private property. The volunteer sandbagging efforts put forward March 23 and 24 are for residents use. Pallets of sandbags will be brought to your property for you to arrange placement. The city does not provide plastic sheeting or pumps. View river predictions for Lock & Dam 5a here. Click here and enter your name, phone number, and email. Call the city clerk/treasurer’s office (608-687-7481) and provide your name, phone number, and email. The Public Works Department is asking residents to discontinue discharging water from sump pumps into the sewage system. Residents will also need to comply with ORDINANCE # 26 pertaining to installing basement drains. Please check back frequently for updated information. 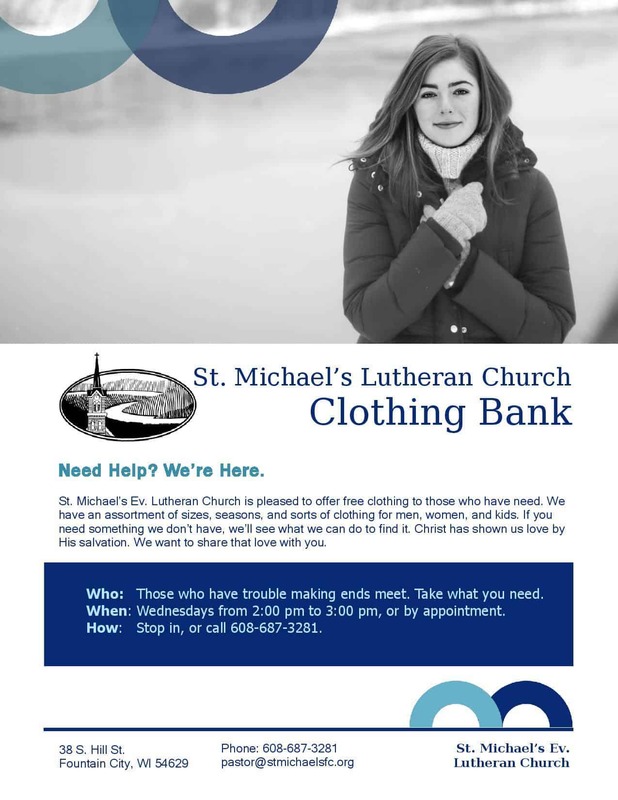 St. Michael’s Lutheran Church has recently opened a clothing bank for persons in need. Clean, quality, gently used clothing is available for men, women and children of all sizes and for all seasons. Clothing is available free of charge and is available on Wednesday’s from 2 p.m. to 3 p.m. or by appointment. Appointments can be arranged by calling 608-687-3281. Open Gym Begins December 3rd! Open gym will again be offered on Mondays and Wednesdays from December 3rd through March 27th from 6:30pm to 8:30pm. The Highway 35 project in Fountain City has been postponed until further notice. Proper notice of any road closure will be given as far in advance as possible. 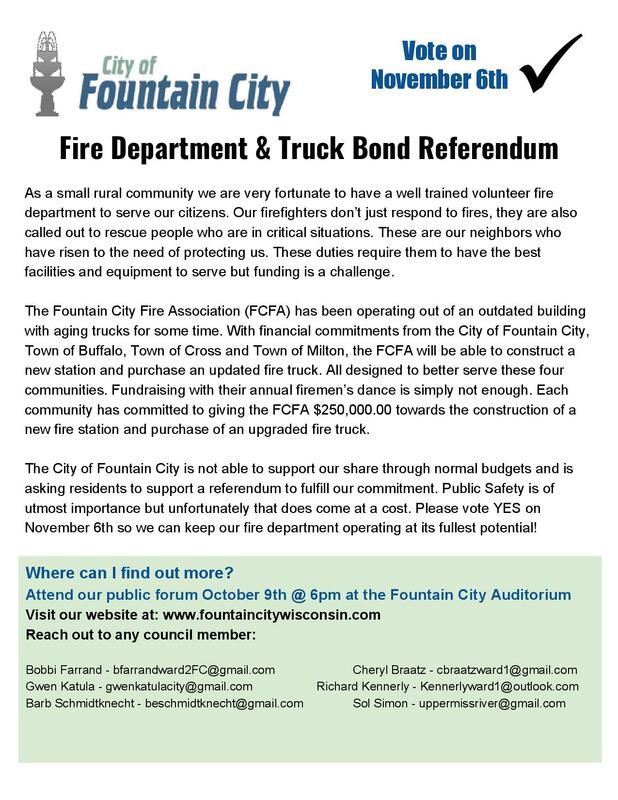 Further updates will be available on the Fountain City website once known. 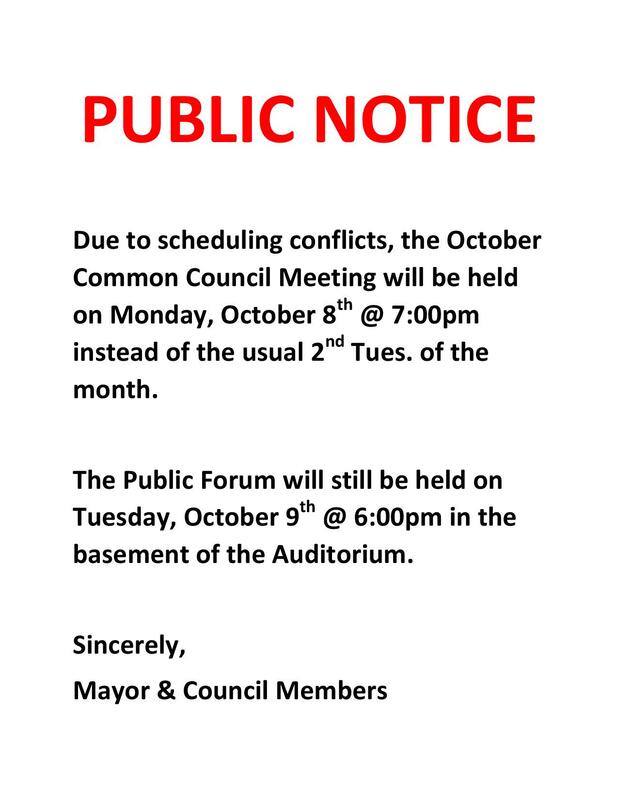 The October Common Council meeting has been rescheduled to October 8th, 2018 @ 7:00pm. 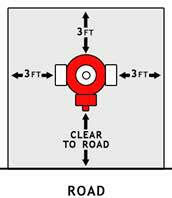 Hydrant Flushing will be taking place September 17th to the 21st. This may cause some discoloration and pressure surging which is normal during this process. You may want to flush your pipes with running water to clear the discoloration.